What appears to be a baby Mink or Finn whale has been impaled and killed on a Princess cruise ship that docked in the Port of Vancouver Saturday morning. The whale, about 20 metres long, was wrapped around the bow of the ship Saturday in full view of tourists at Canada Place. A worker from the cruise ship, who didnt want to be named, said he was not sure when the whale had been hit. The boat  the Sapphire Princess  had come in from Alaska on the Inside Passage, he said. From what I hear there was a bit of a rumbling this morning, he said. Its too bad; I wish we had some system to detect them. Theres a lot of whales out there [on the route], but its not like were dodging them, he said. A Scottish couple, John and Margaret Davis, said they were scheduled to leave on the ship at 4 p.m. for Alaska. Margaret said she had specifically selected the cruise for whale-watching. Its a shame, its not the way I wanted to see whales, she said as she looked on from a balcony outside Canada Place. By mid-morning, a diver with a yellow helmet could be seen wrapping a blue rope around the carcass for removal. The Queen of Nanaimo will be out of service on Tuesday, April 21 and Wednesday, April 22 for mandatory inspections, which can only be completed when the vessel is not in operation. A replacement vessel for the Queen of Nanaimo is not available at this time. BC Ferries encourages its Southern Gulf Island customers to travel via Swartz Bay and onto Tsawwassen. For those travelling from Tsawwassen, BC Ferries recommends travelling via Swartz Bay to the Southern Gulf Islands. BC Ferries thanks its customers for their understanding and apologizes for any inconvenience this may cause. BC Ferries has raised the prices on all its minor routes by 7.25 per cent, the government-owned corporation announced Wednesday night. The prices were raised as part of a replacement of the seasonal pricing structure with a simplified year-round fare, effective April 1. The changes don’t apply to the major ferry route between the mainland and Vancouver Island and the Tsawwassen-Southern Gulf Islands route. 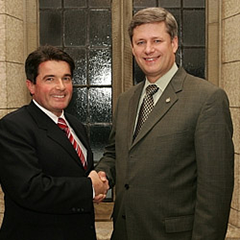 Saanich-Gulf Islands MP Gary Lunn with Prime Minister Harper. Watchdog wants Elections Canada to investigate. The co-manager of Conservative cabinet minister Gary Lunn’s re-election campaign, Byng Giruaud, helped a third-party advertiser get signs to support his candidate. It’s just one of the details revealed in financial reporting released in recent weeks for candidates and third party advertisers involved in the Oct. 14, 2008 election. Five months after voting day, questions remain about the role third-party advertising played in Saanich-Gulf Islands, where five previously unheard of groups bought ads to support Lunn. Lunn was natural resources minister at the time, but after the election was demoted to a minister of state position. For the full story, go here. (PENDER ISLAND, BC) January 21, 2009  Morning Bay Vineyard of Pender Island is pleased to announce its new value-priced wine portfolio. Morning Bays wine portfolio includes some of the most distinctive single-vineyard releases in BC. The award-winning winery has been making wine since 2002. Morning Bays wines reflect distinctive regional expression and old-world sensibilities. Open just three years, Morning Bay has already won three national and international medals for its wines. Join us at the tasting room Friday to Sunday between noon and 5. Wine by the glass special now $5. And watch for our new Ten Buck Barrel. The Port Browning Marina Resort has a new manager, Lenora LeMaitre, most recently of the Silva Bay Resort and Marina on Gabriola Island near Nanaimo. Renovations are being done to the kitchen, cafe and pub, and Lenora has stressed the importance of catering to local residents. Kicking off 2009 is BIG HOUSE VOODOO BLUESBAND, featuring Amy Heggie and Rick McMullen. A New Years Eve buffet dinner starts at 7pm followed by dancing with champagne at midnight! Cost is $50. per couple or $30. per person. Skip the buffet and join in the dancing from 9pm with champagne at midnight for $15. per person. Tickets are available at Port Browning Marina Resort. Lenora, the new manager, looks forward to meeting you!